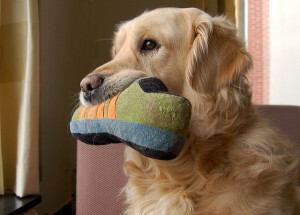 Dogs love grabbing things you love, like your shoe, showing it to you and running off with it. In their minds, this is an invitation to play. They grab your toy, you chase them. What do you do to save your shoes from this game? First off, make sure your dog has plenty of toys and that you play regularly with your dog. Do not laugh when he has your shoe (or anything else). It’s really hard, but don’t laugh. Make sure nobody around you laughs. Tell him firmly to leave it (or drop it or whatever term you use). Try to say it with a low, calm voice. Don’t yell or scream. Don’t chase him around the room. If he’ll do it, tell him to sit and then walk up to him. If not, try offering him a treat or something that will make him drop the shoe. If treats don’t work, run away from your dog. Run towards a smaller space, a smaller room or corner where you’ll be more likely to be able to get the dog. If the dog listens to one person in the family better than you, don’t feel bad about having that person retrieve your shoe for you. Your dog will still learn that it’s bad to take your shoe.